Blessings Of The Moon Maiden: “The Moon Maiden, with her Lucky Hare, brings auspicious tidings of prosperity and abundance to you now. The Universe seeks to replenish, restore and create through you. Allow yourself to receive beyond what you have thought is possible by opening your heart with gratitude now. Let the blessings of good fortune from the beloved Maiden of the Moon, Kuan Yin, flow easily into your life now. Gifts of abundance and prosperity are flowing to you now. You are being asked to open up to what you believe is possible and then open some more! Allow good fortune in all its forms to come to you. Don’t limit what you are capable of attracting with false beliefs about how much you deserve or what you are worthy of having. The Universe will share with you so much more than you imagine possible as you open your heart and let go of self-imposed limitations, doubts or fears. The Moon Maiden blesses with great generosity, blessings of good fortune and peace, yet we must trust how these blessings come to us and accept that we may need to grow for those blessings to manifest in our lives. All blessings need energy within us in which to vest, like a seed needing soil in which to be planted so it can manifest in the physical world as a vital healthy plant! Blessings such as a new partnership, life path, career opportunity, growth in personal or spiritual power and financial healing require energy within us to be able to settle and grow into physical form, to be enjoyed and shared in our lives. Our beliefs, openness, vitality and trust need to be big enough to receive the magnificence of the blessings coming to us. Otherwise it is like asking a wonderful vast oak tree to be planted in a tiny pot or an ocean to be contained in a thimble! Do you know how easy it is for you to attract even more goodness and support for this growth in your life? Hav gratitude for what you already have received and how you have already grown! These blessings would not be coming to you if there was not a readiness and ability within you to receive them. So share something of what you have with others in a way that expands rather than depletes you. You may choose to share kindness, your talents, love or affection, knowledge or material resources. Give from the desire to do so from the heart. Do not seek to give our of fear, obligation or guilt. Just give what feels good to give and your heart will open with joy rather than close with anxiety or fear. You will feel good and move even more deeply into the flow of abundance. The divine feminine endlessly creates, over and over again, flowing in cycles, just like the Moon. If you have been through a challenging cycle where your creative ability to manifest seemed to be impeded, this oracle indicates that the tide is changing and your finances, energy, relationships, and vocation are being infused with abundant universal energy now. Accept this Divine Grace and know that your abundance helps others feel abundant too. It is a spiritual service to live a life of fullness and joy. Take a few moments to consider the area in your life where you would like growth, healing and abundance. Prosperity and good fortune have many faces – material wealth is one, and relationship is another, professional success might be another and spiritual fulfillment and relative expression are yet other faces. What are the faces of abundance that you wish to experience more of in your life? Once you have identified which areas you would most like to receive healing in (realizing that the healing will usually affect all areas of your life no matter which channel it comes through), take time to articulate and perhaps write down in your journal at least three negative beliefs that you have about this part of your life. Then consider three positive situations that you would like to experience and perhaps write them in your journal. Gently close your eyes and imagine you are in a mystical place with a full moon in deepest night, shining brightly. Imagine Kuan Yin dancing with beautiful light all around her, lotus blossoms pouring from her feet and golden light shining towards you from her hands. Imagine offering her your negative beliefs from your journal – you can even read them aloud to her if you wish – and allow her to shine golden light from her hands, flooding these beliefs with light and transforming them into positive energy. Imagine the lotus blossoms of her feet tickling the crown of your head as she sends the healed, positive energy back to your heart chakra. Imagine breathing it in and when you are ready, you may like to say the prayer below or simply say “than you” and open your eyes. 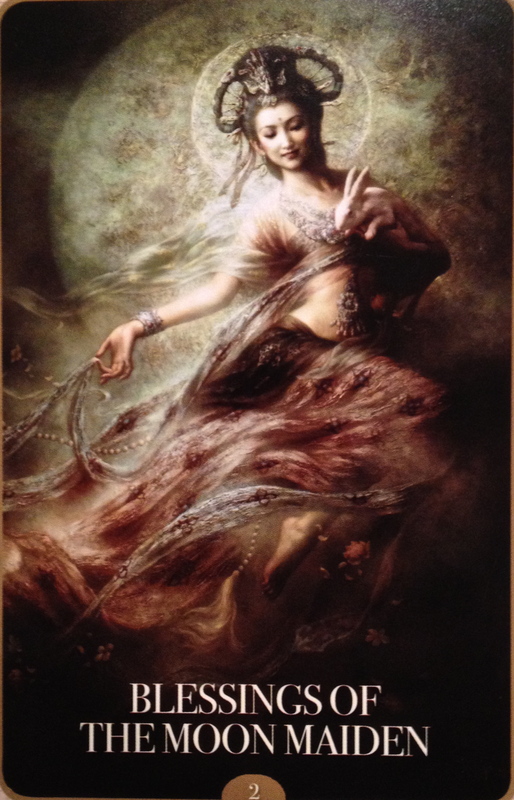 With gratitude and grace, we lovingly accept the blessings of prosperity and abundance from the Moon Maiden, Kuan Yin. May her blessings set our souls free. Today is the new moon and new moons are the time to plant seeds, set intentions, create goals and acknowledge dreams; making the space to bring them all into reality. What is your intention for the next full moon on the 24th and how can we plant the seeds today? How can we take action towards the creation of our dreams? We are in the process of our journey into the underworld and here we are in the darkness, no light of the moon to guide our way. What can we learn as we journey? What patterns can we recognize, what blinders can we remove, and what habits can we finally break? Where do we need healing in our lives? Where do we need expansion? What needs to be released in order to create space? Now is the time to dive deep and find the darkness we have been hiding away from the world. Now is the time to process it, to heal it and to let it all go. There is light after the darkness; there is joy, prosperity and abundance. But we have to wade through the darkness first. We have to make it into the depths in order to clear the way back. Alana has such beautiful healing cards – thank you for sharing!